I have been looking for a great white chicken chili recipe for the longest! I just feel it’s not something everyone gets right in restaurants. And since I love it so much, I wanted to make it at home and be able to have it whenever I want. Well, the Neelys on Food Network knocked this one out of the park! I was eating this for 3 days! White chicken chili is a great alternative to regular chili. It doesn’t take long to make and is a fantastic one-pot dish. It’s also something nice to make on the weekends and have it for lunch because it continues to get better and better as it sits and all of the flavors meld together. Poblano peppers are my favorite pepper so I was thrilled when I realized this recipe used them. This dish has the perfect amount of spice, earthy tones, and flavors that I just couldn’t get enough of. Every bite was better than the last. Please, please, please make this soon before summer hits! After all, who wants chili during the summer??? Drain and rinse the canned white beans. In a medium bowl, mash half of the beans with a potato masher until chunky. Set beans aside. Note: For this recipe I used Northern beans but any white bean will do. It’s a larger white bean with mild flavor so I think it blends well with the chili and isn’t overpowering. Add oil to a large dutch oven and heat over medium-high heat. Add peppers, onion, and garlic and sauté until soft and fragrant (~5 mins). Season vegetables with salt and pepper, to taste. Stir in chicken stock and lime juice and bring to a simmer. Add the beans and continue to simmer for 20 mins. Taste and add seasoning as needed. 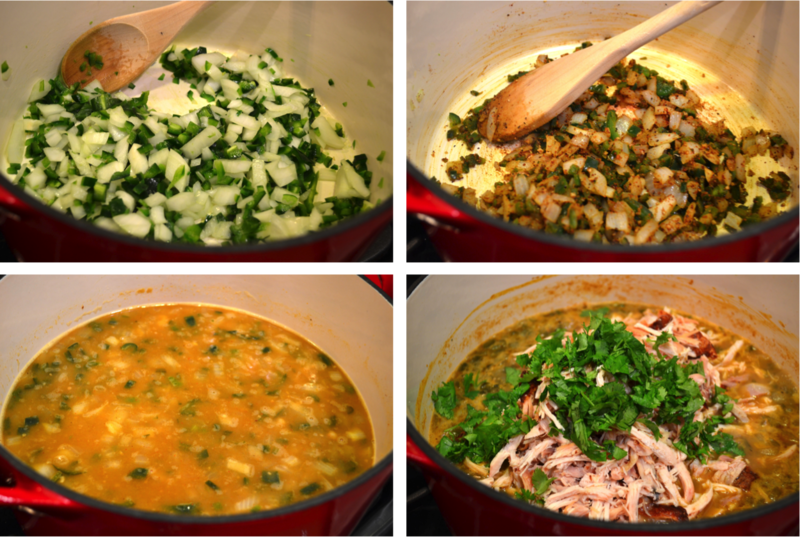 Stir in shredded rotisserie chicken and cilantro and simmer until heated through. Serve chili topped with sour cream, tortilla chips, cilantro, and lime wedges. Tip: Your hands are your best kitchen tools! I shred chicken with my fingers. It’s so much easier than using two forks. All of the garnishes and toppings are a MUST! Do not forget them! The citrus from the lime, freshness from the cilantro, and tanginess from the sour cream takes this way over the top. Definitely blog-worthy! thanks for the recipe - I came across it searching for a potato galette recipe (which I also have used successfully). This is bubbling away on the stove and tastes decicious.